one of the 4 classes above who they will travel with. Please collect your child from the front playground. NOTE: no-one will be allowed back into school. Children who normally go home by bus have been given an additional letter today – please also return that slip to school to let us know arrangements. ALL THOSE PARENTS WHO HAVE VOLUNTEERED TO HELP WILL BE NEEDED. PLEASE ARRIVE AT SCHOOL AT 1.00pm – wherever possible you will be placed with your child’s class, however it is not guaranteed. Children will be eating lunch at school before we go and do not need to bring any other food for the afternoon as refreshments will be provided. Children who are having a packed lunch on this day should please bring it in in a NAMED PLASTIC BAG rather than a lunch box. All children will need a rain-coat, and a sun-hat if the forecast is good. Children may bring cameras if they wish, but the school can take no responsibility for any loss or damage. AND RETURN IT TO SCHOOL BY MONDAY 2 JULY. SCHOOL DRIVE AND STAFF CARPARK – NOT FOR PUPIL DROP OFF PLEASE! Please can we remind parents NOT to use the school drive or staff car park when dropping off children in the morning. It is too busy a walkway for families and there is not enough space for cars to turn. There have been some near misses recently with parents reversing down the drive and nearly hitting children walking up. On Wednesday the Year 5 & 6 pupils will have a chance to hear a presentation from a double Olympian and have the opportunity to ask her questions about her sport and the Olympics. Hours: 1 hour and 20 minutes per day. Please apply by Monday 2 July to the school office. The wind and wet weather last Friday meant the Summer Fete venue had to be changed to the school hall, but there was a good turn-out despite this. The Friends are really pleased to let parents know that the event raised £1029. They would really like to thank all those who kindly helped set up, run stalls and clear away. If you enjoy cooking at home with and for friends, then why not enter this new competition. The prize will be the chance to cook your own two-course menu on one of the stages at the Aldeburgh Food and Drink Festival on Sunday 30th September 2012. Contact 01473 734017 or email jenny@aldeburghfoodanddrink.co.ukfor an application form. Submit your own two course menu (starter and main or main and pudding) using fresh local Suffolk ingredients as much as possible. Up to four children will be able to cook on stage – two children preparing each course. Entries must be received by 30th June 2012. Good luck! With this letter Y2-Y5 pupils will receive a letter about Guitar tuition in school from September. The deadline for returning the completed slip is Friday 6 July. Mr Osbourne the tutor can then meet all the children on Weds 11 July to determine groups for the Autumn. All current guitarists who wish to continue should also complete the slip, please. We will still have spaces in the school Nursery for September. If you have a child who will be 3 before 31 August then do ask at the school office for an application form or to arrange a visit. Atlas Fram on New Road have again asked us to remind parents that their car park is NOT SAFE to be used as a cut through, and that children should use the public footpath provided. Our school team had a fantastic day in Ipswich today. They took part in a tournament for Suffolk's 12 district champions. In the morning Framlingham won their group to progress to the knockout stages in the afternoon. 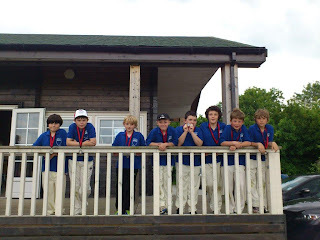 Fram won their quarter final vs Stonham Aspal by 53 runs. The semi - final was against a strong Claydon side. Batting first Fram got off to a flyer with David Dyer hitting 5 sixes. Claydon were always under pressure chasing Fram's large score and finished 54 runs short. Fram saved an even better performance for the final. All of our batters contributed (7 sixes in all). 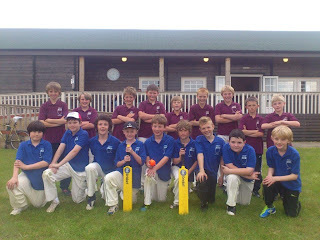 St James's Middle School from Bury were pegged back by excellent bowling from Guy Blades, Callum Tysoe and Jake Seaber to finish 43 runs behind. This was an emphatic result in the final. Fram will now go forward to represent Suffolk in the Eastern Counties Regionals on 5th July. A top 2 finish there would see the boys get to the Nationals. 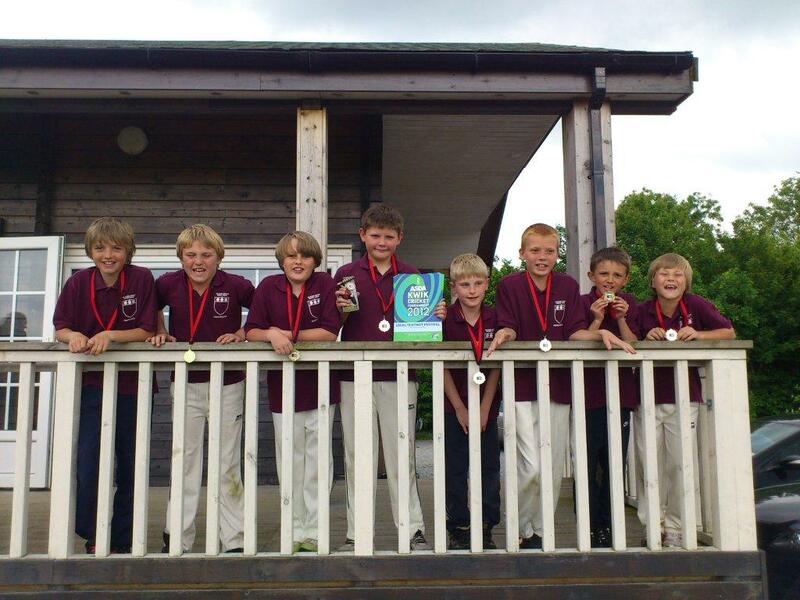 The mid Suffolk cricket tournament was held at Worlingworth Cricket Club on Monday. 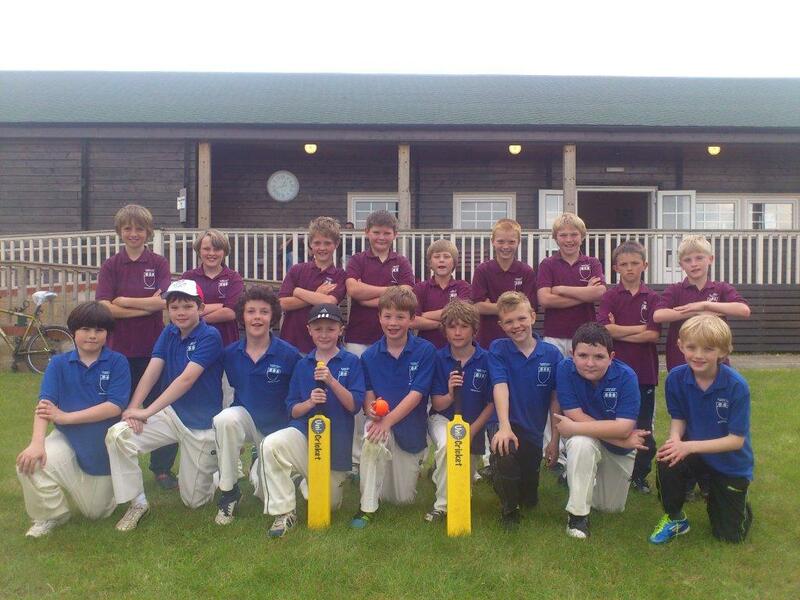 SRH Framlingham entered 2 teams against the other 6 schools taking part. Our A team won every game convincingly. They now go forward to the County Finals next Monday in Ipswich. Our B team (with several younger boys) had a great tournament - only losing 2 matches to finish in 3rd place - winning bronze medals. Mr Miller (husband of Mrs Miller from our school office) came in to talk to us in assembly this week about his role in the Olympics. He works for BT and is working on behalf of the Olympics to put together internet and phone connections for all of the journalists coming to London from around the world. Over 20,000 people will be working in the huge media centre in the Olympic park. He also spoke about the Olympic values. Next week we are having another visitor in assembly who has taken part in a previous Olympics as a hockey player. This year’s Sports Day will be bigger and better than ever before! It will take place on the morning of Friday 29 June (weather permitting – reserve day is Monday 2 July). The whole event will have an Olympic theme, including an opening ceremony and a podium. Please bring rugs or deck chairs to sit on; we ask that all parents are seated on the field by 9.25am to be ready for the parade of ‘Athletes’. Each Foundation/Key Stage 1 class and each Key Stage 2 House will represent a Country in the parade. The field will be laid out for both ‘Track events’ and ‘Field events’ with the spectator areas at either side – parents can freely move between the two spectator areas to watch their children on either track. Children must have their full PE kit in school now for practices, please check plimsolls/trainers fit. We would like the children to be under shade, so in the centre of the field we aim to set up a covered area for them. If you have a large gazebo you are happy to loan for the event, please can we ask that you let Mr Brook know, and also that you take it to the field on Thursday 28 June from 1.15pm to meet Mr Brook. 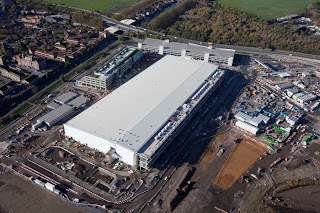 We also need large tarpaulins or rugs for them to sit on. If you can help set up the gazebos on Thursday 28 June, ideally from 1.15pm then please let Mr Brook know. It would also be of great help if any parents can stay at the end of the event on Friday to take down the gazebos and marquees. Thank you. We hope the Friends will have a marquee at the event from which they will be selling refreshments during the morning for parents, so do remember to bring some money. We hope you can join us for this event and look forward to it kicking off our week of Olympic activities. We still need helpers on Mon 1.15, Weds 11.15, Thurs 1.15 and Friday 1.15. Please offer your help at the office, without it some classes cannot swim. Please find with this letter the latest Scholastic Book leaflet. Please complete and return to the office with payment by Monday 25 June. A reminder for any parents who wish to make a book donation to mark their child’s last year with us, to please hand your form and donation into the school office as soon as possible. If there is a book you wish to order from the Scholastic leaflet for this, then please speak to Mrs Miller in the office. Thank you. We are very sad to let parents and pupils know that Mrs Reeve will be retiring from her Teaching Assistant post at the end of the Summer Term. Mrs Reeve has been with the school since 1981 and has known many of the current parents as pupils here in those 31 years! All the staff will miss her support, dedication, cheerfulness and hard work and we are sure the pupils will miss her very much too. We are, however, extremely pleased to say that she will continue with her office hours managing the dinner money 2 mornings a week. If any parents would like to make a donation as a thank you gift for her work with the pupils then that would be lovely. Please hand your donation in at the office in an envelope marked ‘Mrs Reeve- donation’. Thank you. As mentioned in last week’s letter Mrs Stephenson will also be leaving us at the end of the summer term. If any parents would like to make a donation for her leaving gift then that would be lovely. Please hand your donation in at the office in an envelope marked ‘Leaving Gift – Mrs Stephenson’. Thank you. I am delighted to announce that Mrs Spencer will be returning from maternity leave on Monday 9 July. I am sure that all the pupils in class NS would like to give a big THANK YOU to Mr Snowden for teaching them since October; we would like to wish him every success. The proofs will be handed out this week, if you wish to order a copy then please return the proof to the school office with the correct payment by WEDS 27 JUNE. All payment should be direct to ‘Gilman & Soame’. Late orders with incur an additional fee. The ‘dress up’ day to celebrate the Jubilee last half term raised £210.25 for the Queen Elizabeth Diamond Jubilee Trust, this includes over £31 raised by class GA/JB who used coins to make some ‘Royal Art’ – do look on the BLOG for pictures from the day. Congratulations to the Grant family who were the winners of our ticket draw held on Friday – they win 3 tickets to the Olympic Basketball in the summer, along with 3 travel cards. We have been advised that there has been a case of Threadworm in the school. We felt it was important that parents and pupils understand a bit about this as it is quite common in children under 10 and can very easily be spread. “Threadworms are the most common type of worm infection in the UK, and they are particularly common in young children, infecting up to half of all children under the age of 10. Threadworms are white and look like a small piece of thread. You may notice them around your child's bottom or in your or your child's stools (poo). They don't always cause symptoms, some notice itchiness around their bottom, which can be worse at night and can sometimes disturb sleep. In school, teachers have been discussing with the children about the importance of regular hand washing, especially after using the toilet. Please can we ask that parents help to reinforce this message. Thank you. This is the last week this term for Violin lessons, they resume in the autumn. Forms to take up Violin form September were sent out on 1 June, please can we remind interested parents to return the reply slip. Thank you. Pimms Bar, Cream Teas, Ice Creams, Cakes, Sweets and more! Lots of games, stalls and prizes to be won! There will be a plant & produce stall too – if you have any plants, vegetables, fruits or preserves we can sell please bring them in on Friday. If you stay till the end, it would be great if you could help clear up. Mr Brook had the pleasure this morning of opening a special envelope from London 2012. It contained 3 tickets to the Olympic basketball tournament. It also included 3 free London travel passes and a spectators guide to Olympic basketball. The draw for these tickets will be made in assembly this Friday with the tickets going to one lucky family. Welcome back to everyone for an extremely busy last half term of this school year! We hope you enjoy everything we have planned. Please check with your child’s class teacher if they need additional adult helpers so that they can swim. The following classes NEED MORE OFFERS: LC KT CH KM PLDD & JC. The pool cover repair has been delayed, but we hope to start swimming towards the end of the week (weather dependant!). Don’t forget your child’s swimming kit. Please can we remind all pupils to bring their school sweatshirt in with them on Wednesday for the class photos. Year 6 pupils will also have individual photos taken. Reminder for all KS1 children to bring their packed lunch and other essentials for the trip on Thursday to Felixstowe. Don’t forget sun hats if hot, and to put on suncream on at home. Reminder for all Nursery children that the trip to Easton Farm Park is on Friday. Please see Mrs Stephenson if you have any queries about the arrangements. THE OFFICE WILL NO LONGER BE SENDING OUT INDIVIDUAL PRE-PAY FORMS; it will be parents’ responsibility to pay the due amount by the deadline. DINNER MONEY (whether paid weekly or half-termly) SHOULD BE PAID ON A MONDAY. WE REQUIRE ALL HALF-TERMLY PAYMENTS TO BE MADE BY THE FIRST MONDAY FOLLOWING THE START OF EACH HALF TERM. There are 6 full weeks in this term (30 days). However, Nursery to Year 5 will be 29 days due to summer outings, and Year 6 will be 24 days due to Camp and a day at High School. DEADLINE FOR PAYMENT IS MONDAY 18 JUNE, PLEASE. We are pleased to welcome a new teaching assistant to Reception; Miss Lamb will be joining Mrs Mawson’s class and I am sure the children and parents will give her a warm welcome. Mrs Stephenson, our Nursery Teacher, is moving on to teach Reception in another school in September, we are sure parents would like to join us in wishing her well and to thank her for all her hard work in the Nursery. I am delighted to announce that Mrs Eyles, who has been in the Nursery for 10 years will be taking over the running of the Nursery in September. The cathedral art that the Year 5's in class EM worked on last half term will be on display as part of the R.E.S.P.E.C.T. 2012 Exhibition. This is being held at St Edmundsbury Cathedral in Bury St Edmund's from Saturday 16th - Thursday 21st June. As long as parents have given a note to the class teacher about a change to their child’s going home arrangements, there is no need to also call the office. The Friends would like to thank al the children and parents who baked for the cake stall on the last day of term, they are delighted that the cake sale raised £131. • For the ‘Cream Teas’: plain/fruit scones suitable for freezing (ie not previously frozen). • Chocolates for a Chocolate tombola; also items for a Children’s Tombola. FOR THE JUBILEE FETE ON FRIDAY 22 JUNE. THEY CANNOT RUN THE FETE WITH OUT A LOT OF HELP… please see the yellow slip sent with this letter about adding your name to the chart on the Friends Notice-board by the hall. Presentation of special mugs to every child in the school - by Dr Dan Poulter our local MP. The children all came in red, white & blue costumes for the day. Everybody paid a contribution to the Diamond Jubilee Trust Charity. Special cakes were made and sold at a cake stall by the Friends Association. Some children from year 6 organised a coin collection - over £31 raised. The term began with our best Year 6 and 5 swimmers taking part in the interschool swimming gala. The children came 4th out of all the local schools; with a number of our swimmers coming 1st or 2nd in their races. The children’s attitude to taking part was superb. The Year 5’s this term have been busy again with their singing workshops at Thomas Mills High School along with a number of local schools, their concert to parents will be on 25 June at the High School. Years 3 & 4 had a super time at the Farm Fair at Trinity Park even though it was rather cold and wet. Nursery held an ‘Open Afternoon’ for prospective parents, in which they were able to show off the newly fitted nursery kitchen which enables all nursery children to enjoy regular cooking sessions. The children in lower Key stage 2 and in Key Stage 1 have enjoyed their teaching on Road Awareness and we are really grateful for the support of the volunteer parents who made their ‘traffic trail’ learning walk around Framlingham possible. A number of classes have taken advantage of the wonderful help from the Suffolk Wildlife Trust who arranged for the children to have outdoor learning sessions at the Mere. This was a huge success and we are looking forward to other children benefitting from this learning opportunity in the future. Cycle awareness has been running this half term for our Year 5 children. Mr Byer, with his tireless energy, has been running the sessions with Mr Mulrenan and the support of a wonderful team of parents without whom it could not run. The children have all been working very hard in preparing for and taking their SATs, I am sure they and all the staff are pleased that these are now finished for another year! We are rounding the term off today with celebrations for the Queens Diamond Jubilee. Your child will have been given a commemorative mug (donated from the Framlingham Business Association) by our local MP, Dr Dan Poulter, today; the Friends have kindly bought each child a commemorative bookmark as a memento of this occasion; as well as generously supplying the refreshments for today’s Jubilee Tea Party on the playground, for which special thanks must go to Mrs Chapman for baking 360 cupcakes! We are all looking forward to an exciting last half of the summer term where many of the activities will be centred around the topic of the Olympics, including a very special sports day.